606 Forest Hill Circle, Elizabeth City, NC.| MLS# 102624 | Outer Banks Homes For Sale, North Carolina Home Search Including Nags Head, Pirates Cove, Manteo, Kill Devil Hills Kitty Hawk, Southern Shores, Duck, and Corolla North Carolina, Oceanfront and Soundfront properties for sale and long term rentals. $BANG 4 BUCK$ This remarkably priced home is located within minutes from HWY 17, VA/NC state line, USCG, shops & restaurants while nestled in a quite location. 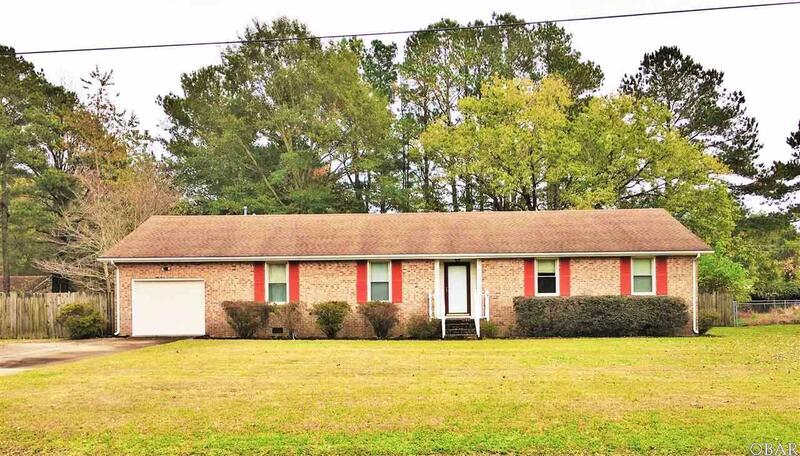 With the opened floor plan, large updated kitchen, great room, dining room, 3 bedrooms & 2 full baths this home is not lacking in space. Enjoy the spacious private fenced in back yard from your enclosed sunroom year around. Front roof has been replaced, crawl space inspected, freshly painted throughout, professionally cleaned & landscape complete. The only thing this home is missing is YOU! Call today to view. Easy to show.